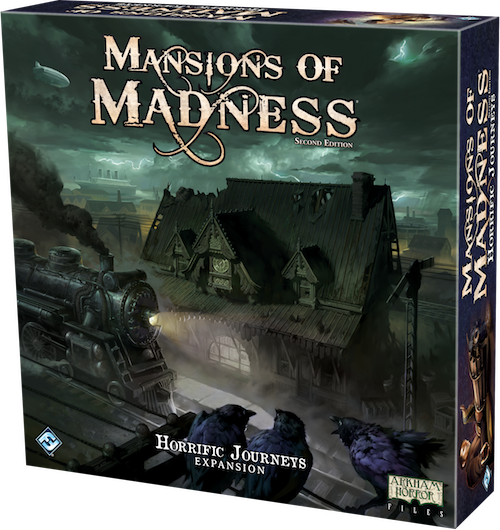 Horrific Journeys is a new expansion for Mansions of Madness which unlocks three thrilling scenarios that take four new investigators far from Arkham, solving mysteries aboard a bustling transatlantic airship, a luxury ocean liner, and a scenic countryside train. With new map tiles, puzzles, monsters, and mythos events, these brave men and women must contend with hideous amphibian monstrosities and interdimensional creatures tearing holes in the fabric of reality, all with the knowledge that one wrong move can destroy the very vessels they are trying to protect! To arrive at their destinations, the investigators of Arkham must first survive their journey! Pick up your copy of Horrific Journeys at your local retailer or online through our website today!